• For Dogs With Gas Or Cats That Throw Up 20 Minutes After Eating. • Vomiting and Diarrhea Are Quickly Relieved. • Made With Real Pumpkin! 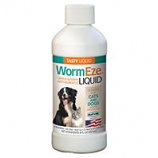 A liquid dog and cat wormer for use in food or drinking water for the removal of large roundworms. For use on dogs cats puppies and kittens over 6 weeks of age.. Inexpensive control of roundworms the most common worm infestation in puppies and adult dogs. Tasty liquid for easy administration. Can be added directly to the pet's drinking water or food. A concentrated enzyme blend from vegetable sources that contain live, viable micro-organisms to support a healthy digestive system.